Compare to our Final Forecast, view our Closest Scenario, and view an analysis of the battleground states. 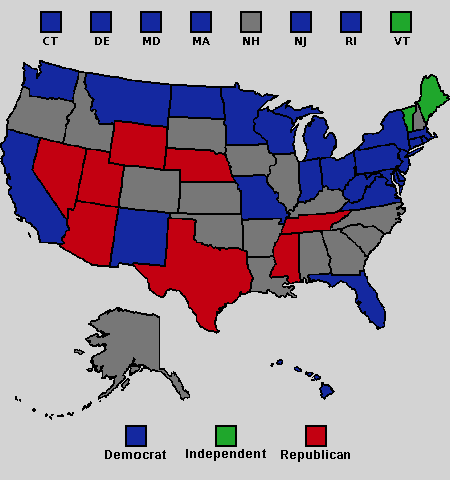 The 2012 United States Senate elections are now history, with the Democratic Party retaining majority control of the Senate. Our model correctly predicted 31 of the 33 Senate races. In the Neutral swing scenario, the expected number of Senate seats for the Democrats and Independents was 53.6, while 55 were actually achieved. This discrepancy corresponds to an error of 1.87 standard deviations (based on a standard deviation of 0.75). The Strong Democratic swing scenario was the closest to the actual results, predicting 53.9 Senate seats for the Democrats and Independents. All of these races, except for Montana and North Dakota, were correctly predicted.